It’s that time of year again—ice fishing season! Some might even say it’s the best time of the year. 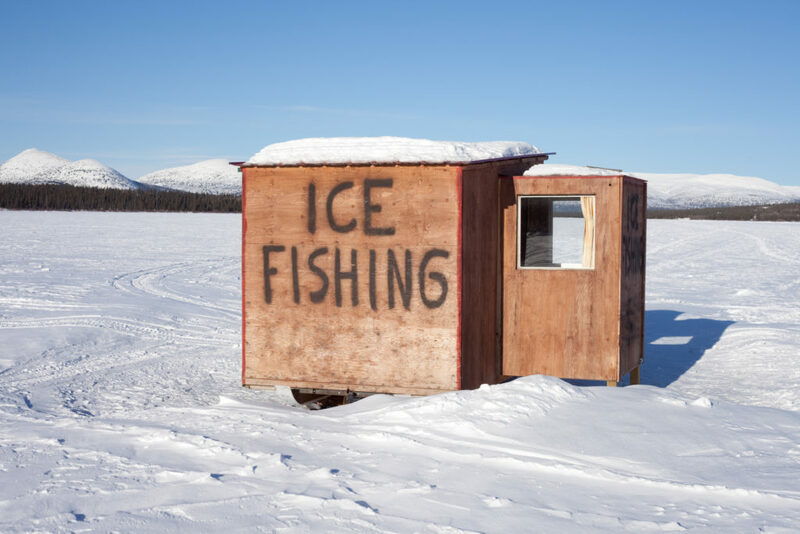 This winter, we’ve put a list together of some of the top places to go ice fishing in the country. From Vermont to Montana, there are tons of places you can fish to catch that trophy perch or walleye. Park your RV and bundle up anglers, we’re going fishing! 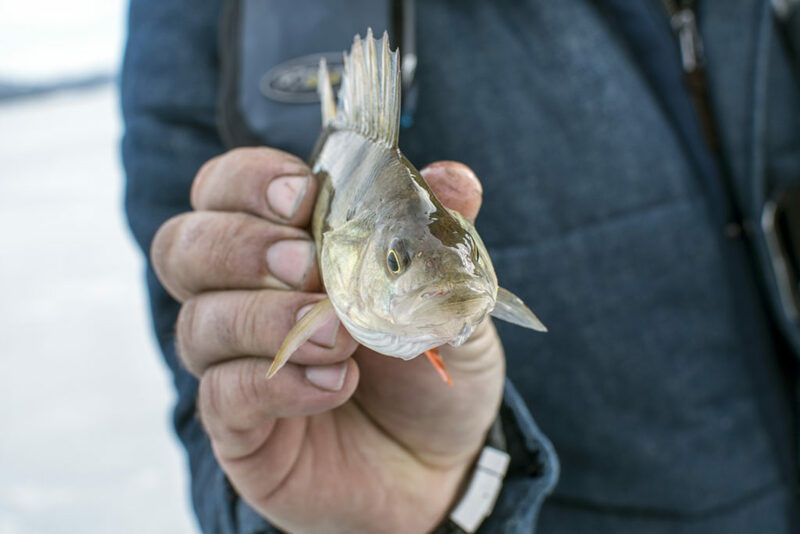 Located in eastern North Dakota, Devils Lake is one of the top ice fishing locations in the nation and is a hotspot for those wanting to catch jumbo yellow perch. The lake covers over 3,800 square miles and has continued to grow for the past 25 years. This makes it easy to find secluded fishing spots. Known for its large trophy perch of two pounds or more, Devils Lake is also great for catching walleye and pike. Many anglers even reach the limits of these fish before lunch! There’s many nearby bait shops and knowledgeable guides to take you out onto the lake if you’re a first-time ice fisher or just unfamiliar with Devils Lake. There’s plenty of accommodations surrounding the lake, including hotels, lodges and RV campgrounds. The town itself is built around the fishing industry. Therefore, many hotels and campgrounds have fish-cleaning stations and boating docks available to rent. In Glacier County, there are several lakes that freeze over just in time to become angler favorites in the winter. Flathead Lake is the largest natural freshwater lake in the western United States. It commonly offers whitefish and lake trout, as well as the occasional yellow perch and cutthroat trout. Along the Seeley Swan Valley of Glacier County are Salmon Lake and Placid Lake. These lakes offer bull trout, kokanee salmon and northern pike, too. Park your RV alongside any one of the many lakes within this area and you’ll be reeling in fish in no time! The Irish Hills include a collection of 52 smaller-sized lakes where you can find a wide variety of fish in the winter. It’s an ideal ice fishing spot that you can explore for days. Some types of fish found in the Irish Hills are bluegill, crappie, panfish, perch and rock bass. Anglers will never get bored ice fishing in this area. All the lakes are relatively close to each other and never lacking in fish. If you know what type of fish you want to catch, you can target it and find some in almost every lake in the Irish Hills. There’s also RV campgrounds spread out along the lakes, allowing anglers to park and explore all that the Irish Hills has to offer. This ice fishing destination is known for trophy walleye and perch fishing. It’s also home to the International Eeelpout Festival every February. The festival is one of the largest ice fishing gatherings in the world, so anglers know they will be catching great fish! There’s many experienced guides to help you navigate Leech Lake, as well as rentable ice shanties and nearby bait shops. As Minnesota’s third largest lake, it is a hotspot where anglers hunt for trophy fish. It’s also one of the few lakes that freezes over every year due to the state’s below-zero temperatures. RV camping is popular in the area, but hotels and lodges are also available. Don’t forget to book your spot early to avoid the festival goers! If you’d rather stay close to the East Coast, then Lake Champlain is a great ice fishing spot for you. While the lake has recently had some warmer days, the season still starts in January and ends in March. When the ice is thick enough, anglers can catch salmon, lake trout, northern pike, yellow perch, walleye, and crappie. You can’t beat that variety! The fish also range in size and many species can be found throughout the 120-mile long lake. The nearby RV parks make ice fishing on Lake Champlain convenient and accessible. The surrounding wildlife also gives you the opportunity for hiking and sightseeing if you can bear the cold. You can even venture up to Canada if you have the time, as Lake Champlain touches the Canadian border. 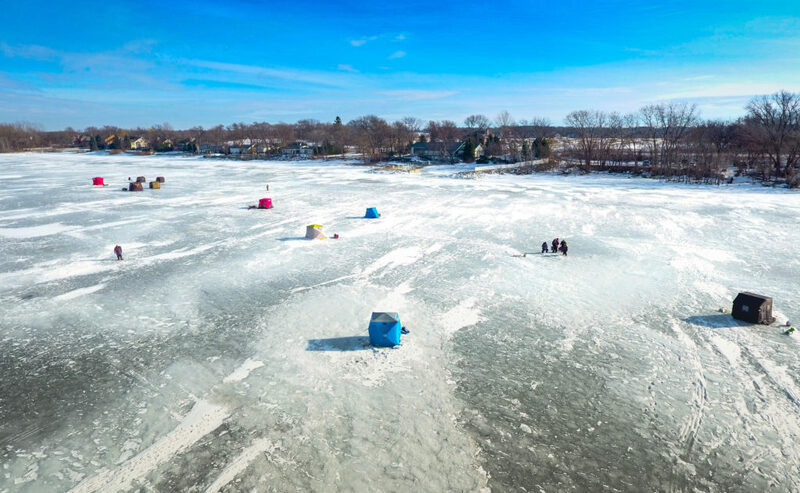 This great ice fishing destination is finally frozen enough to support anglers looking for the best walleye fishing they’ve ever seen! Catching walleye of over ten pounds tends to be common, as well as hooking some yellow perch and crappie. Some of the best fishing spots on Lake Erie can be six or more miles away from the shore, so many anglers choose to go with guides who are familiar with the best modes of transportation and know how to navigate the harsher weather conditions. Around Lake Erie, there are several RV campground options to choose from. Some of them are right on the lake, giving anglers easy access to both ice fishing and other local activities. There are great lakeview restaurants, lighthouses, and wildlife reserves for families to enjoy, too. 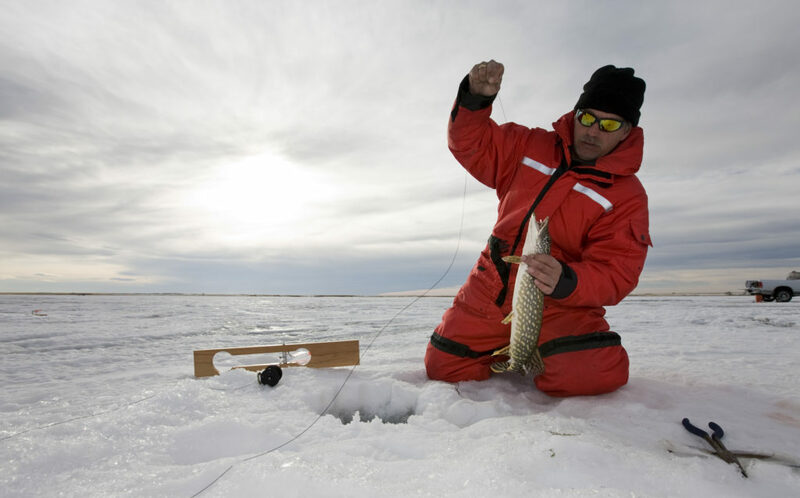 This winter season, don’t miss your chance to ice fish in the 13th largest lake in the world! Another Minnesota hotspot, Red Lake attracts thousands of anglers every year during ice fishing season. Because the lake is basically a huge, shallow basin, there are ample amounts of walleye and crappie available to catch. The walleye here are known for being extremely active under the ice. This makes it either challenging or fun for visiting anglers! There are several nearby RV campgrounds that are affordable and surrounded by the great outdoors. Other outdoor activities for the family include hiking, dog sledding, and skiing. Black Hills is one of the few places where the fishing season never closes! That means that there’s always an abundance of fish, including walleyes, northern pike, bluegills, crappies and trout. Black Hills has over 1,100 square miles of water ready for fishing, but the best brown trout can be found in Rapid, Castle and Spearfish Creeks. There’s several ideal ice fishing spots located within the Black Hills area. These include Pactola Reservoir and Custer State Park that hold anything from rainbow trout to crappies. Once the lakes freeze over, ice fishing begins in January. There’s also many spring-fed creeks that stay flowing, so you can try your hand at fly-fishing, too. With fishing going on year-round, there’s a wide variety of accommodations to choose from in Black Hills. There are RV campgrounds, hotels and lodges that cater to fishers and outdoorsmen. Located in Michigan’s Upper Peninsula, Lake Gogebic is an ice fisherman’s paradise, well-known for its perch and walleye fishing. As one of the biggest lakes in the Upper Peninsula, anglers have an abundance of fish that provide catches for both the novice fisher and the veteran angler. While perch and walleye are the most common, Lake Gogebic also offers smallmouth bass, northern pike and panfish. Besides ice fishing, the area offers one of the best snowmobile trail systems in the country, cross country skiing, and downhill ski and snowboarding facilities. Take the family RVing with you and enjoy all that winter has to offer at Lake Gogebic. 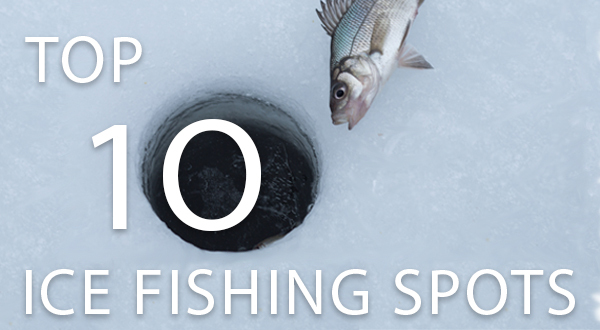 As Wisconsin’s largest inland lake, there are many species of fish beneath the ice during the winter season. Anglers come Lake Winnebago to catch walleye, perch, white bass and sturgeon. The sturgeon are Lake Winnebago’s main attraction. Thousands of anglers come to use specialized ice saws to cut squares in the ice before spearing these large fish. Every ice fishing season, there are sturgeon speared up to the 100-pound mark. There are many lakeview RV campgrounds available and this is definitely a location you want to book in advanced if you plan on catching the biggest sturgeon this season! You’re probably only thinking about reeling in your next big catch, but don’t forget about your safety first. 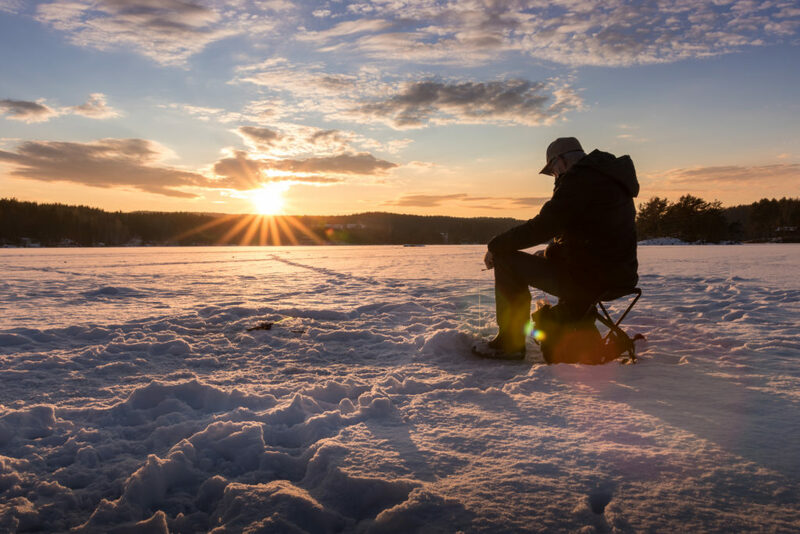 If you plan on taking an RV road trip to some of these prime ice fishing locations, make sure you know what your RV Insurance covers. To find out if you have RV Insurance coverage for traveling out of state, call (866) 501-7335 and speak with an Insurance Specialist today. The information in this article was obtained from various sources. This content is offered for educational purposes only. It does not represent contractual agreements, nor is it intended to replace manuals or instructions provided by the manufacturer or the advice of a qualified professional. The definitions, terms and coverage in a given policy may be different than those suggested here. Such policy will be governed by the language contained therein. No warranty or appropriateness for a specific purpose is expressed or implied.